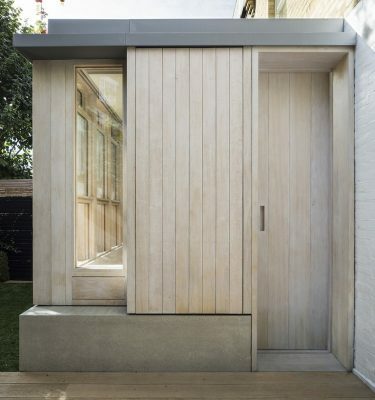 A timber extension has been completed by Studio Carver in Belsize Park, North-West London. 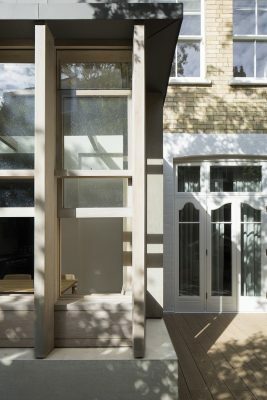 Designed for a young Anglo-American family, the extension was inspired by traditional timber conservatories of the Mid-West. 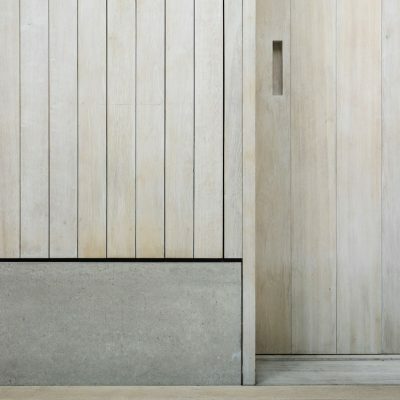 This addition to the original Edwardian house creates a light and homely space for the family out of sustainable oak, poured concrete and zinc cladding. Built for £75k out of a tiny plot size of only 10sqm, Studio Carver’s innovative design replaces the previous conservatory and offers an increase in both natural light and privacy as well as greater visual and physical connections to the garden. The timber fins and windows rest carefully atop a concrete plinth grounding the new conservatory, opening up the home with a modern design. 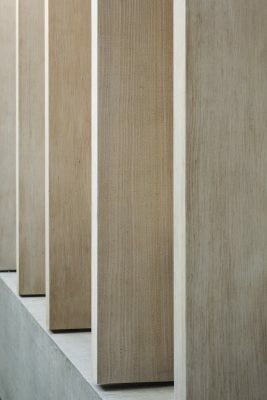 Sustainably sourced white oiled oak cladding, combined with exposed concrete, creates a calm palette and subtle contrast to the existing London stock brick and white painted house. 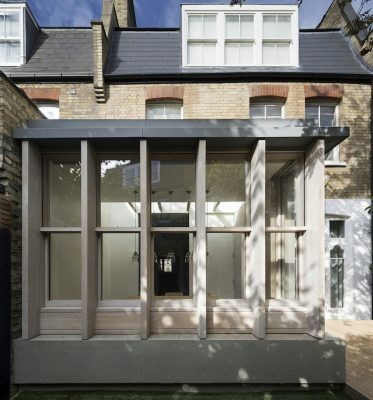 Working with Devonshire-based carpentry company Emanuel Hendry the structure was designed and tested off-site first and then re-assembled at the Belsize Park home reducing construction time and costs. 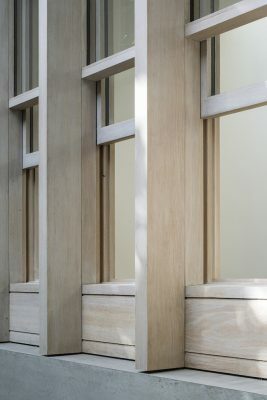 The collaboration between designer and carpenter enabled them to push the limits of typical timber frame construction and achieve something unique and beautiful on this small back garden site. 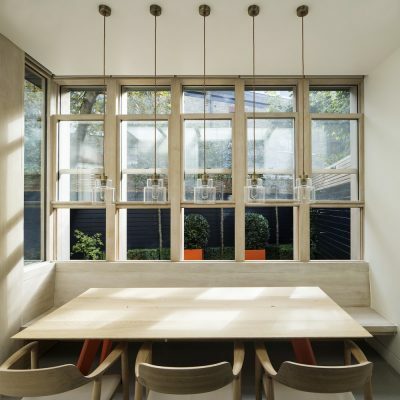 Furniture was designed into the conservatory; internally an oak bench spans across the rear elevation creating a modern dining area that’s efficient with it’s space. Occupants can sit against the glazing, experiencing the garden and landscape while still protected from the neighbouring properties. 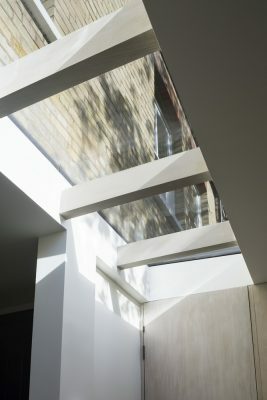 A large, strip skylight between the extension and existing house separates the new from the old and together with the external timber fins create a rhythm to both the structure and how natural light enters the room. 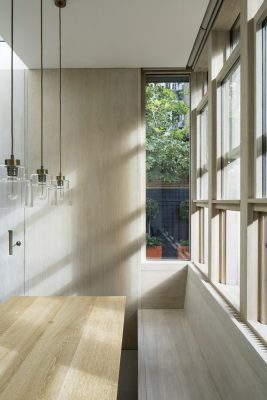 Belsize House was shortlisted for Architects’ Journal Small Projects Award 2017 and Camden Designs Awards 2017. 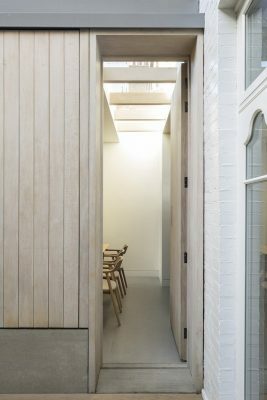 Studio Carver is a London-based architecture and design practice founded by Keith Carver in 2011. With work ranging from commercial projects to individual homes and bespoke furniture. Studio Carver taking in all elements of the design process from detail, construction to completion. Priding themselves on exceptional client relationships, founder Keith Carver originally hails from Boston, Massachusetts and has over 15 years experience in the design industry., Studio Carver’s work is rooted in core principles of sustainability and good design, ensuring their work remains functional and flexible to end-users.